Our firm has gained rich industry experience in the field of providing Garlic Leno Bags in industry. These are made in such a manner that they prevent the garlic from spoilage and protect it against moisture. Our vendors have made the perfect utilization of world-class materials and advanced technologies in fabricating these bags. 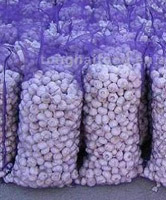 Our bags make the garlic fresh for long time duration. Shree Ambica Industries is one of the most dynamic, technology driven company, which offers tailor made packaging solutions – complete range of polypropylene (PP) woven bags, polypropylene (PP) woven sacks, high density polyethylene (HDPE) bags and sacks as well as woven fabric. While our corporate office is situated in Surat and have a state of the art manufacturing unit located at Kamrej – considered to be sourcing base of PP/ HDPE woven sacks, woven fabrics & tarpaulin manufacturing industry, worldwide. With an installed capacity of 14 million bags per annum, we have vertically integrated plant, fully equipped with latest models of extruder machines besides circular weaing, cutting, stitching, sealing, printing and lamination machines of brands Lohia, Arm Strong, Navjeevan and JP Industries respectively. Besides, we also have an advanced R&D as well as quality control lab and to ensure quality of the product, we conduct rigorous tests on parameters like weight, tensile strength, UV protection and gauge etc. The advanced machines and well-trained workforce enable us to execute all the bulk orders with perfection and within stipulated time frame. Our endeavor is to design and develop reliable, durable and cost effective packaging solutions for industries as diverse as Food Products, Animal Feed, Chemicals & Fertilizers, Petro-chemicals, Engineering & Industrial Products to Cement, Polymers and Retail industry – to name a few. We ensure consistent quality, competitive pricing and on time delivery – every time at any part of the world.